Stretching from Bushmen's Nek in the south to the Royal Natal National Park in the north, the mountainous wilderness areas that make up the Ukhahlamba-Drakensberg Park (UDP), cover an area of 243 000 hectares along a great natural barrier of mountains which form the border between KwaZulu-Natal and Lesotho. This magnificent area is the second World Heritage site in the province. This wilderness wonderland of colossal buttresses, montane forests, tumbling streams, towering cliffs and deep valleys is a hiker's paradise. Black eagles and bearded vultures soar between the steep basalt cliffs. Eland, oribi and rhebok wander through the sandstone-flanked valleys below and in the secret caves many San Bushmen paintings can still be found. In fact some 22 000 individually painted images have been recorded with some rock shelters having more than a thousand paintings in them alone. (These may not be visited without a guide. The provincial conservation authorities administer the Park and a number of outdoor activities as well as a variety of accommodation options are available for visitors, priced from budget to luxury. The park is generally divided into three sections being the southern, central and northern 'Berg.It is quite difficult to tour the region in the traditional sense because the road system linking each area is fairly limited requiring some circuitous routes to get from one place to another. It is best to choose one region, book in for a night or two and explore the immediate area. In all sections of the Ukahlamaba-Drakensberg Park the hiking trails are expertly laid out, good maps are available, with campsites situated at the start and end of most of the wilderness trails. Mountain bikes are allowed in some areas as are four-wheel-drive vehicles, and trout fishing opportunities abound once you have a permit, which can be obtained from the authorities. Accommodation both in and outside the Ukahlamba-Drakensberg Park is plentiful and varied ranging from rustic huts and caves for hikers to luxury resort-type hotels, from campsites and bungalows to B&Bs and private homes. Cobham Nature Reserve, Loteni and Garden Castle Nature Reserve make up the southern section of the Ukahlamba-Drakensberg Park with Himeville and Underberg being the two closest villages.You pass through one or the other in order to reach Sani Pass which climbs to an altitude of 2 874 metres and is at present the only link road between KwaZulu-Natal and the rugged mountain tops of Lesotho. The 6,5 kilometre drive is usually undertaken in a 4X4 vehicle and daily tours up the pass are available with the option of a night at Sani Top Chalets on the edge of the escarpment. In winter it is usual to wake up to a snow covered winter wonderland. Kamberg, famous for its rock art, and Giant's Castle, roughly link the southern and central berg regions. 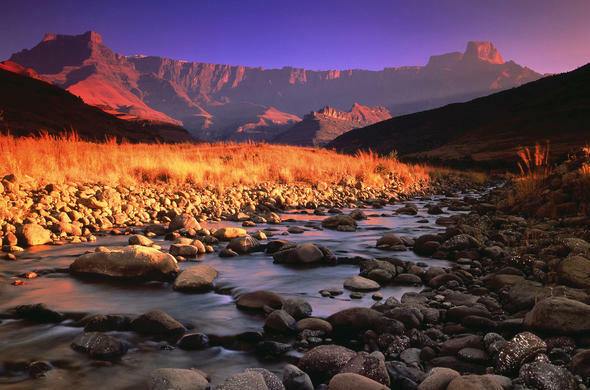 The Central region is by far the busiest and most popular section of the Ukahlamba-Drakensberg Park. Here Injasuti, Cathkin Peak, Monk's Cowl, Champagne Castle, Cathedral Park and the beautiful Ndedema Gorge can be found. Giant's Castle has a wonderful Lammergeier Hide and Vulture Restaurant. The hide takes only six people and advance booking is necessary. Giant's Castle also offers some spectacular wilderness hikes with overnight accommodation in cosy caves. The region also has some of the most superb collections of rock art in Main Caves, which is a relatively short walk from Giant's Castle rest camp.Injasuti has three caves that can be booked for overnight stops when hiking and this area has fine examples of rock art at Battle Cave. All the rock art sites may only be visited with a guide. The focus of the northern 'Berg section is without a doubt the magnificent sheer basalt rock face known as the Amphitheatre, a wall of rock measuring more than 2900 metres high and 4 kilometres. Accommodation in this section of Ukahlamba-Drakensberg Park is offered at Tendele Hutted Camp with each bungalow affording a view of the Amphitheatre. Tendele Lodge has wonderful views and a large fireplace for the icy winter months. Mahai Campground is a large campsite at the foot of the range catering for 400 campers, while the nearby Rugged Glen Campsite around the mountainside is smaller with a more intimacey in busy seasons.